You already know how much I love all my individual meal and dessert portions. I’ll take them in ramekins, jars, or pretty little pastry packets. It’s all delicious fun in my book. 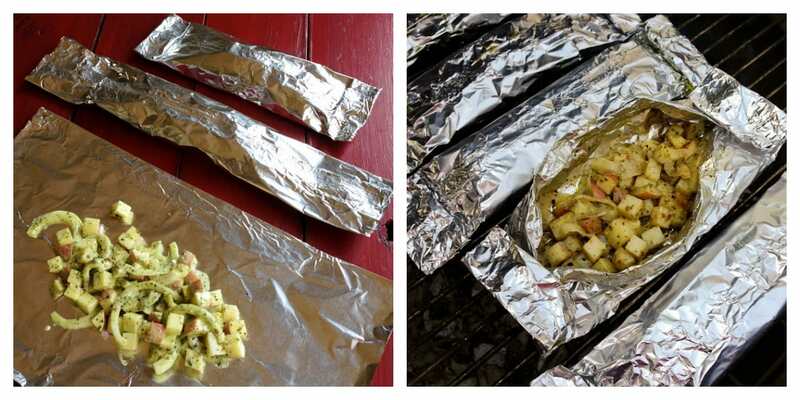 And this recipe I’m sharing with you today requires nothing more than a box of foil wrap to create personal side dishes for your family and friends this summer. Grilled potatoes could not be easier than this recipe for Grilled Red Potato Packets with Pesto Ranch Sauce! I created this easy summer grilling recipe on behalf of Black Gold Farms, who I have partnered with the past two years. Do you remember when I visited one of their farms in Missouri a couple summers ago? Black Gold Farms is a multi-generational family owned organization that is based right here in the Midwest, out of Grand Forks, ND. The company has been in business more than 80 years and currently ships more than 500 million pounds of potatoes annually, that end up on your plate for meals or get made into potato chips for snacking. That’s alot of potatoes! When it comes to fresh produce, red potatoes have dibs on versatility. They are the perfect canvas for countless flavor combinations and ethnic pairings, and couldn’t be more diverse when it comes to methods of preparation. But I am focusing on summer here. Quick and easy, fun and flavorful. 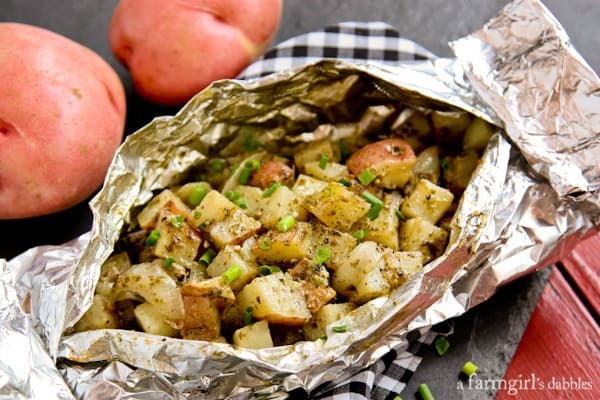 These grilled red potato packets will have everyone wishing they could have just one more! These hand-folded packets are like a little gift off the grill. The potatoes and onions are nestled in their own little dish, super tender and flavored with a fabulously easy combination of basil pesto and ranch dressing. To add a little color and fresh mild onion flavor, snippings of fresh chives are sprinkled over the opened packets. Don’t let summer slip by without adding this to your menu! 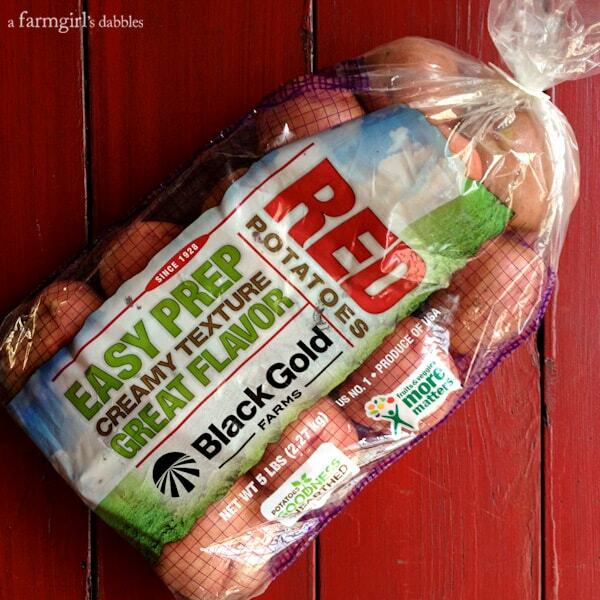 You can also check out some of my red potato recipes on the Better With Reds site from Black Gold Farms. Great picks for summer would be the Grilled Red Potato Salad with Lemon and Herb Dressing and the Red Potato and Chickpea Salad with Tangy Honey Mustard Dressing. Yum! Black Gold Farms also has a couple fun things lined up this week to help get us prepared for summer meals. Please join me for the #BetterWithReds Twitter Party this Wednesday June 4th at 8:00 pm CST. 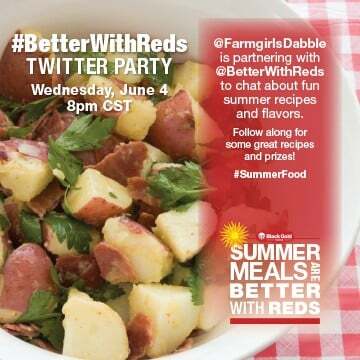 I’ll be hosting the party along with Better With Reds, and we promise you an hour of chatty delicious fun about summer food and the versatility of red potatoes. And there will be prizes! Don’t miss it! Just follow @BetterWithReds and @farmgirlsdabble on Twitter. 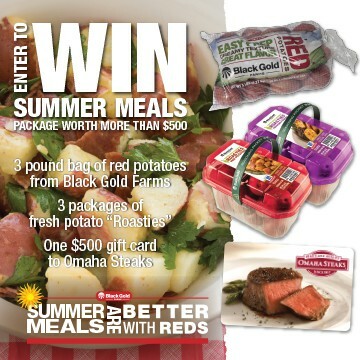 We’ll be using the hashtags #BetterWithReds and #SummerFood! The other exciting thing going on is that there’s a great giveaway! You could win a prize pack valued at more than $500, full of all kinds of delicious ways to enjoy summer. To enter, go here! A fabulous group of bloggers has joined me in this tasty #SummerFood fun. Please visit these sites for more red potato recipe inspiration with #BetterWithReds! You can also find Better With Reds on their website, facebook, Twitter, and Pinterest! Place potatoes and onion in a large bowl. In a medium microwave safe bowl, gently melt the butter in the microwave. Stir in olive oil, ranch dressing, and basil pesto. Depending on the flavor and pungency of your pesto, you may want to add more than 1/3 cup. Sometimes I add more ranch dressing, too! Season with salt and pepper to taste. Different store bought varieties and homemade versions of ranch dressing and basil pesto have varying levels of sodium, so adjust according to your tastes. Pour pesto ranch sauce over potatoes and onions, and then fold to combine. Tear off 6 pieces of 18″ x 18″ heavy duty foil wrap. Fold each square in half to make a rectangle shape. 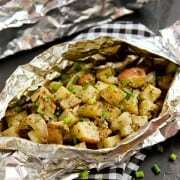 Divide the potato and onion mixture between the 6 pieces of foil. Then bring the 2 long sides up over the potatoes so that the long sides meet. Fold them over and crease tightly. To finish the packet, fold each of the shorter ends over a couple times and crease tightly. (There is a photo in this post that shows what the packets should look like). Heat grill to medium. Add packets to grill grates, creased side down and grill for 15 minutes. 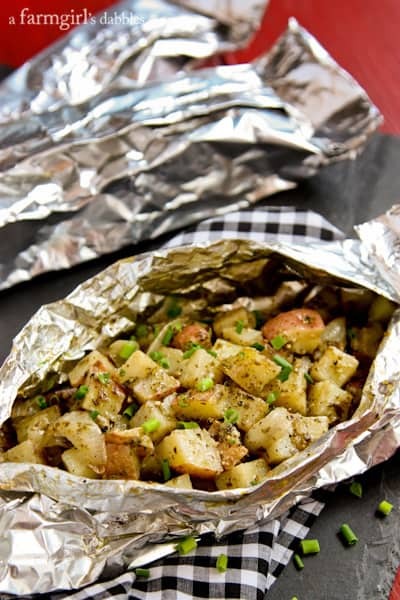 Flip packets over and grill for an additional 10 to 15 minutes, or until potatoes are perfectly soft when pierced with a fork. Remove from grill and open up packets to create a sort of individual “bowl”. Sprinkle with fresh chives, plus additional salt and pepper if desired. Serve hot. Disclaimer: This post is sponsored by Black Gold Farms, a company I’ve been proud to partner with for the past two years. All opinions are 100% my own, as always. Thank you for supporting the brands that help make this site possible!